New PDF standard in business mailings! Create and send PDFs as a business or as an individual. As easily as you have never done before! Print PDF files, send these by e-mail or save, print and encrypt them with our PDF software PDFMAILER FREE. No costs and with no sponsored ads included. No timely or functional limitations. 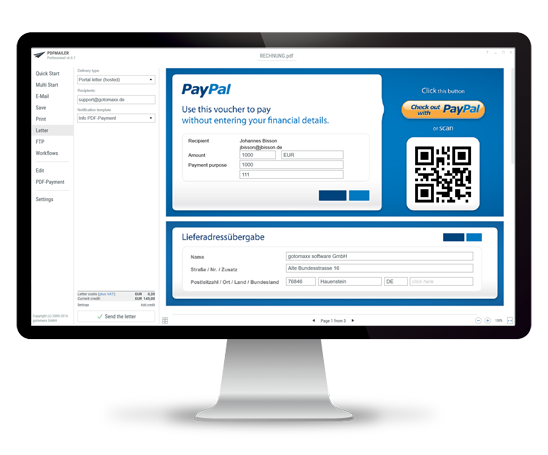 You can try and download our software for private use now! Create PDF files for business purposes with our PDFMAILER PROFESSIONAL (1 user) or PDFMAILER SERVER (5 users), automatise dispatch procedures, turn PDFs into paper-based post through web services & have them mailed in one step. Software producers and solution suppliers can take advantage of tools to optimise business mailings of their own customers. Become a part of our great partner network and join us improving our business mailing solution. Because complex systems often solve one problem but instead create two others, we opted to build well engineered but simple PDF software. You may use PDFMAILER in its FREE version for your private purpose, or you may purchase the automatable PDFMAILER PROFESSIONAL (1 user) or PDFMAILER SERVER (5 user) version to raise your work-efficiency. Install PDFMAILER as a PDF software on your computer. PDFMAILER displays no sponsored ads and creates PDF files without adverts. The driver for printing is well structured and easy to use. The actions are self explanatory. You can use PDFMAILER in every software to print PDF files. Create, dispatch, save, post, ammend and encrypt PDFs. Printing from every software or by dragging & dropping Office files. 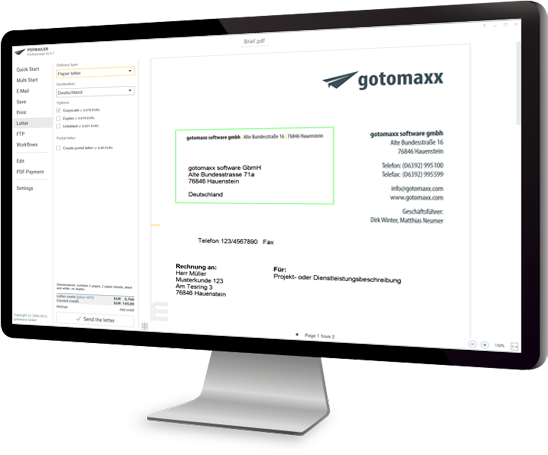 PDFMAILER can be extended to automatise print jobs, manage user rights in a network or send business mailings by snail mail, e-mail or via an online portal. 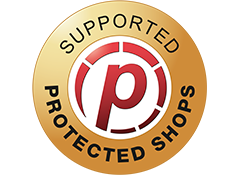 For almost 20 years we helped clients and partners all sizes to create and dispatch PDFs – from individual users, through mid-size companies to multinationals. 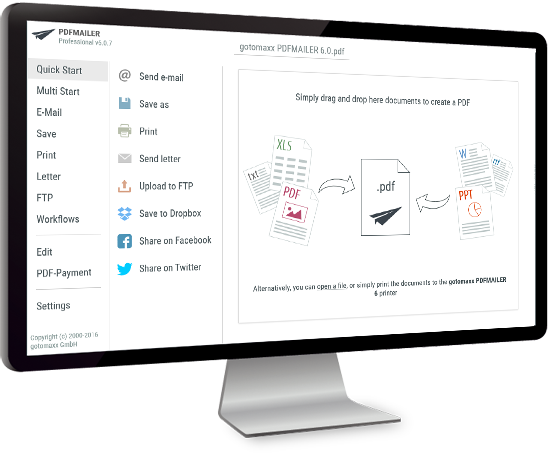 The new version of PDFMAILER FREE has no sponsored ads and is free to use.